When it comes to mouth feel Israeli couscous is up there, and extremely diverse and easy to work with. 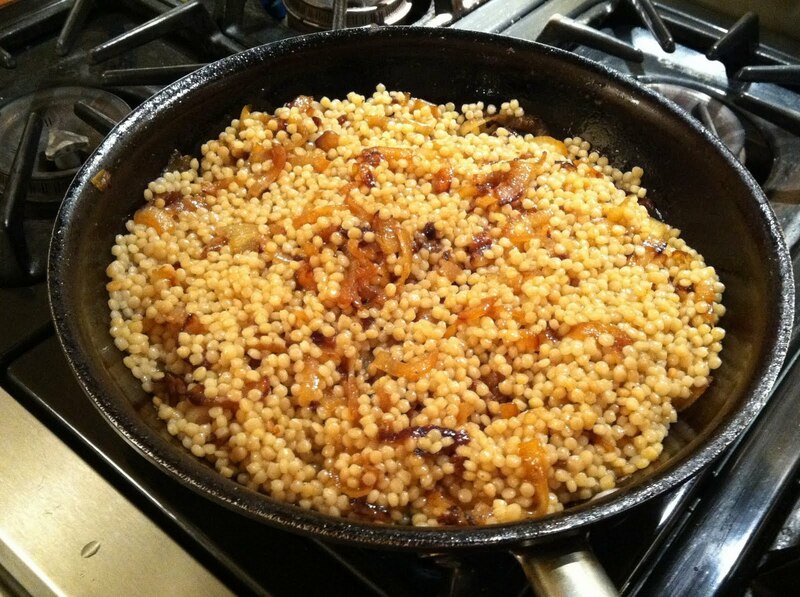 Although called couscous it is actually little toasted balls of pasta so like pasta you just have to boil it for ten minutes or so and drain. Last night I sliced and quartered three Vidalia onions and sauteed them with a mix of butter and olive oil, a tablespoon of sugar and kosher salt to taste until they started to brown. I tossed and turned the onions for about thirty minutes so they would carmelize all over, that's where you're going to get all the flavor. Meanwhile I brought a small pot of water to a boil, added a spoonfull of my favorite beef stock for flavor, Better Than Bullion, and dropped in the couscous. I tested the couscous after ten minutes to make sure they were soft then drained into a strainer being careful to preserve about a half a cup of the beef stock water. I poured the preserved beef stock into the pan with the onions, simmered for a few minutes, then added the drained couscous and salt to taste. If you're doing Italian you could prepare the same way minus the beef stock with lots of grated parmesan stirred in before seving. The possibilities are endless.